Old Ironside’s first underway of 2013 honored heroes, past and present. The USS Constitution sailed in Boston Harbor on June 4 to honor those who responded to the Boston Marathon bombings on April 15 as well as to pay tribute to those who fought in the Battle of the Midway in 1942. 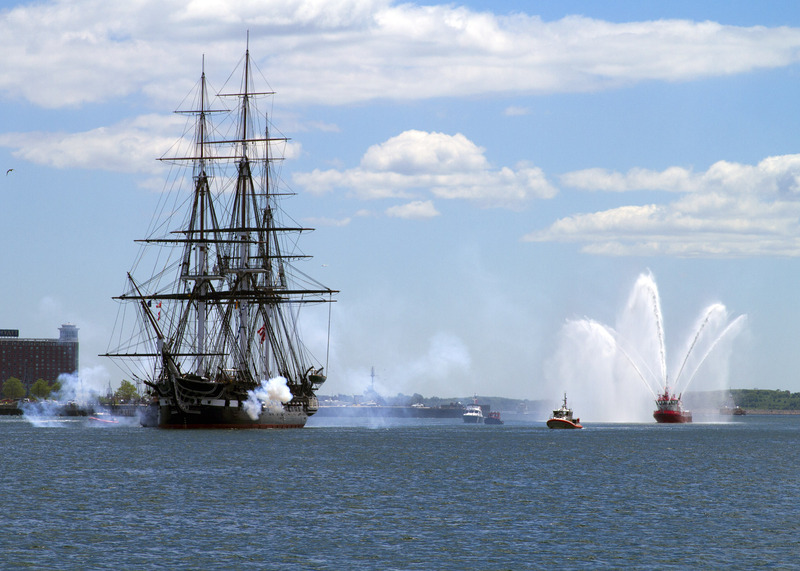 The USS Constitution fires a 17-gun salute during the ship’s first underway of 2013 on June 4. More than 375 Boston first responders took part in the three-hour cruise, which included a wreath-laying ceremony for victims of both the bombing and the battle, as well as a 21- and a 17-gun salute. The first responders onboard came from the FBI, Boston Fire and Police Departments, Massachusetts State Police Department, MBTA Police Department, Watertown Police Department and the Massachusetts National Guard, as well as medical responders from Massachusetts General Hospital, Boston EMS and Boston Medical Center. Two flags that said “Boston Strong” flew atop the mast for most of the cruise. Did she unfurl any of her sails? I think it is great that the first responders were honored but I find it somewhat disheartening that none of the civilians who rendered immediate aid were not included. And while I have respect for the FBI to me they do not qualify as a first responder – to me a first responder is police, fire, ems personnel who are immediately on scene rendering aid to the injured.